Life in the North & South of Italy Aim: To find out what life is like on the NIP compared to the south. 6 Your tasks The North heading is Industry - The North. 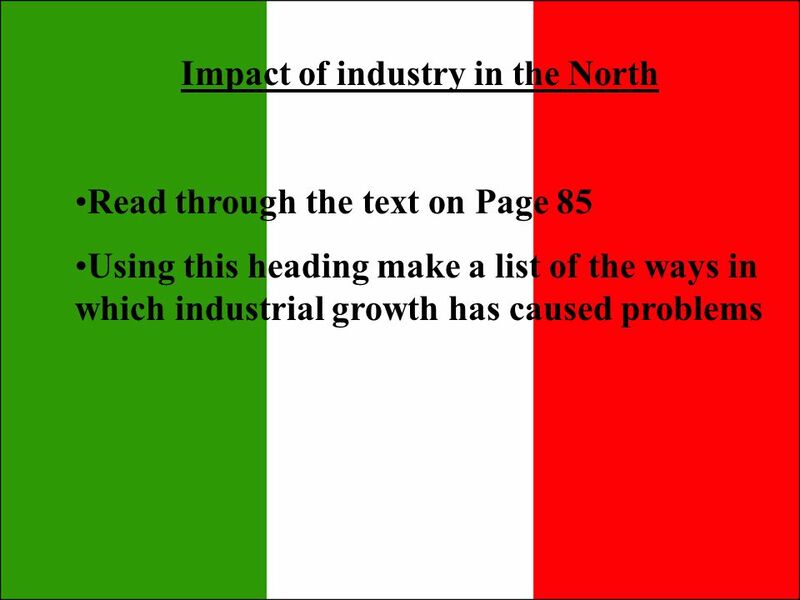 Give the % of people who work in Primary, Secondary and Tertiary industries?heading is Industry - The North. Give the % of people who work in Primary, Secondary and Tertiary industries? Create a spider diagram to show the advantages of farming on the NIP – use fig B, page 84 ~ heading is – The North – advantages for farmingCreate a spider diagram to show the advantages of farming on the NIP – use fig B, page 84 ~ heading is – The North – advantages for farming Complete question 3 a, b, c from the activities box on page 85.Complete question 3 a, b, c from the activities box on page 85. 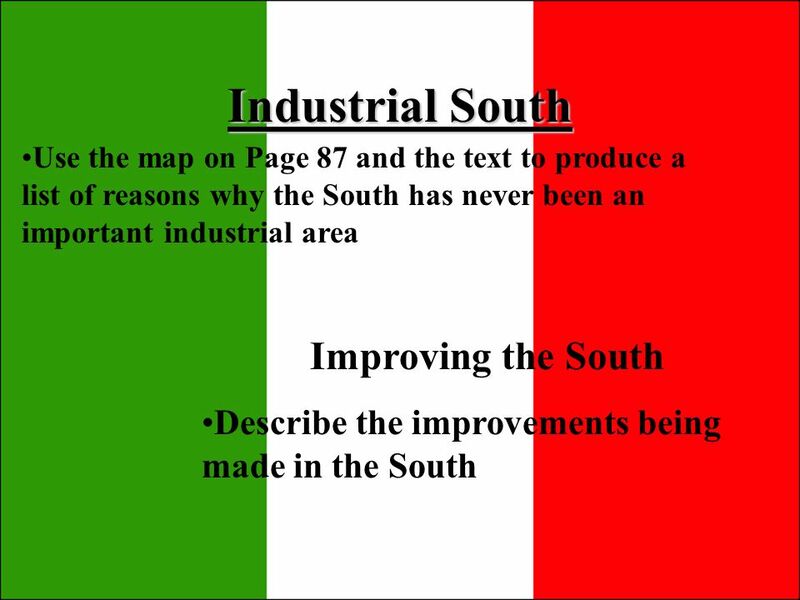 The SouthThe South Complete activity 1 on p.87 Heading is ~ Industry –The SouthComplete activity 1 on p.87 Heading is ~ Industry –The South Create a spider diagram to show the disadvantages of farming in the south –use fig B, page 86. Heading is ~ Problems for farmers _ The SouthCreate a spider diagram to show the disadvantages of farming in the south –use fig B, page 86. Heading is ~ Problems for farmers _ The South Complete question 3, a, b, c from the activities box on page 87.Complete question 3, a, b, c from the activities box on page 87. 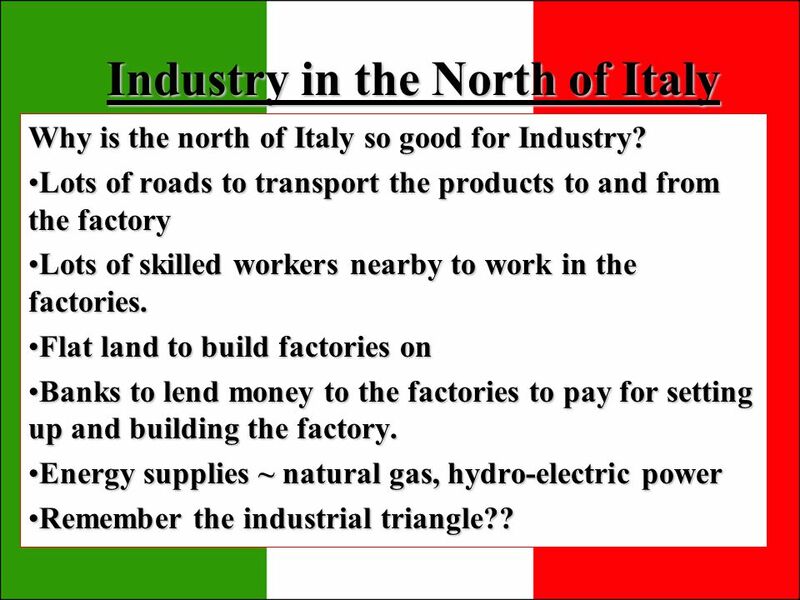 7 Industry in the North of Italy Why is the north of Italy so good for Industry? Lots of roads to transport the products to and from the factoryLots of roads to transport the products to and from the factory Lots of skilled workers nearby to work in the factories.Lots of skilled workers nearby to work in the factories. Flat land to build factories onFlat land to build factories on Banks to lend money to the factories to pay for setting up and building the factory.Banks to lend money to the factories to pay for setting up and building the factory. Energy supplies ~ natural gas, hydro-electric powerEnergy supplies ~ natural gas, hydro-electric power Remember the industrial triangle? ?Remember the industrial triangle?? 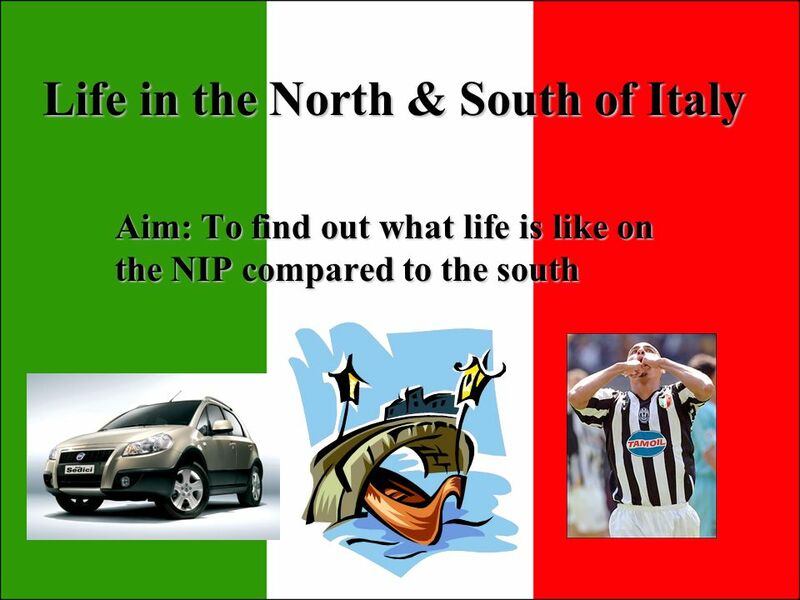 Download ppt "Life in the North & South of Italy Aim: To find out what life is like on the NIP compared to the south." Italy – The Regions Aim: To find out about the different regions in Italy and a holiday you could take in each one. Another name for the jobs we do to get the final product Environmental consequences of declining industries What is an output? Give 3 examples of physical. How do location, climate, and natural resources influence Europe and its people? Standards: SS6G10a. Compare how the location, climate, and natural resources. Topic ECONOMIC ACTIVITIES and GLOBALISATION. 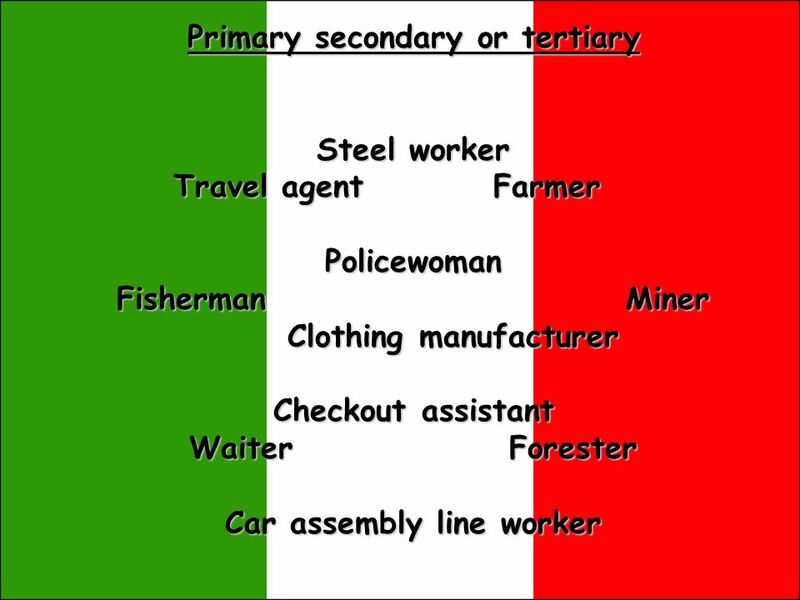 PRIMARY SECTOR This sector deals with RAW MATERIALS eg Fishing / Farming / Mining. Economic Activities Chapter 49. 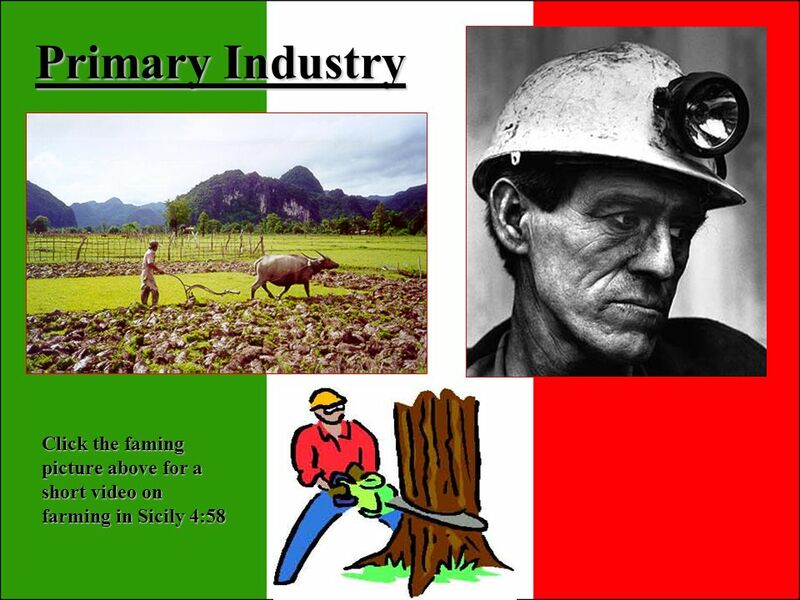 Primary economic activities are jobs that use the natural resources of the land. These jobs include: Farming Fishing. Essential Question  What are the levels of economic development and how do they affect workers? Canadian History 1201 THE ECONOMY.  Natural Resources and Foreign Trade were important parts of Canada’s economy  There was a shift to include a stronger. INDUSTRIAL SECTORS BTEC FIRST BUSINESS - UNIT 1 EXPLORING BUSINESS PURPOSES. Canada’s Economy Chapter 5 Section 3. Contributors to the Economy  Lots of natural resources  Gold  Fishing and fur trading  Canadians work in service. The Growth of a Superpower LO: To understand the reasons for the growth of a secondary sector in China, and effects that this growth has had. Keywords. HW check RB, pp TOMORROW Short speeches? MAYBE LATER. ORGANIZATION OF PRODUCTION. 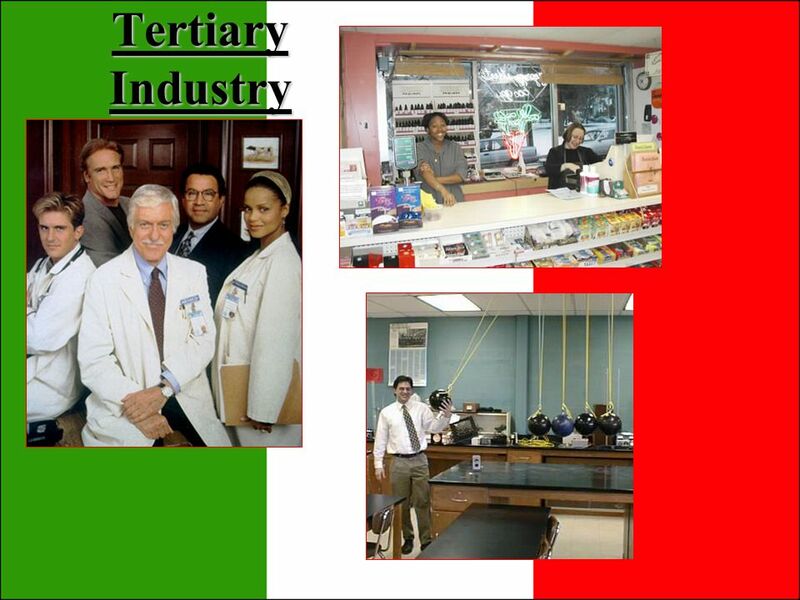 Specialization in Production by Firms Each person or group concentrating on doing what they are best at doing.